It has been with sensational few weeks for some of the sires of our current two year-olds. Helmet, Dawn Approach and Deep Field have all tasted success either on the track, in the sale ring or in the case of Deep Field, both. Helmet capped off an abounding seven days for the breeding of Eden Racing's two year olds, siring impressive stakes winner Tin Hat who took out the Group 3 Manfred Stakes at Caulfield Saturday. Tin Hat is the eighth stakes-winner for Helmet who continues to produce quality gallopers at excellent value. The stable has already had success with the Helmet progeny in three time winner Cavalero and Shea was most excited to welcome another Helmet into the stable; this time a filly. She returned to the stables just last week to embark on her next campaign. Based on the talent she showed last preparation, particularly in her jump outs, she is expected to progress to the races this time in. The Helmet filly is a half relation to five time winner Nina Rules who has won $121,499 prize money. Learn more about the filly by clicking here. 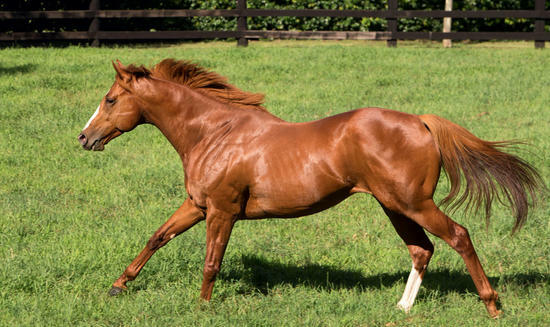 Four-time Group 1 winner Dawn Approach (pictured) had a prosperous seven days on the race track. He sired impressive city two year old winner Dawn Passage who trounced his rivals by a mere three and a quarter lengths at Randwick last Saturday. "He (Dawn Passage) just unleashed a devastating sprint and he had really good race manners. He seems a ready made two-year-old," Blake Shinn said after the win. Dawn Passage now heads to the two year old Inglis Millennium at Warwick Farm this coming Saturday. Adding to the successful week, Dawn Approach had the fastest two year-old trial at Randwick Tuesday morning with dashing chestnut colt Dawn Too Good completing his 900m heat in 54.07 seconds. The Darley stallion clocked in as the sixth leading first-crop sire last season with several promising types. Dawn Passage recording a two year old black type win adds further promise to the prosperity of Dawn Approach in the Southern Hemisphere who currently sits at nine winners for the current season. Our Dawn Approach x Big Birdie filly is currently in work at our Cranbourne stables and is approximately four weeks off jump out. She too is showing the attributes and ability of a ready made two year-old and is generating excitement heading into Autumn. View the filly's profile by clicking here. First Season Sire Deep Field is certainly creating a great deal of interest in racing circles on the back of further strong results in the sale ring at Magic Millions last month and equally as promising results on the race track. Deep Field boasted some impressive stats at the recent Magic Millions Gold Coast Yearling Sale, with 11 lots selling above $200,000 including a colt out of Flamboyant Lass for $450,000 and a colt out of Burgeis selling for $400,00. He currently sits at fifth on the first season sires with three winners from his first 12 runners and looks to have some promising types on the horizon. All three winners scored successfully on debut which suggests the progeny certainly have the ability to be early running types. Two of the debut winners look to be returning Saturday up in grade with Cosmic Force nominated for the two year old Inglis Millennium, while Hawker Hurricane is nominated for the Group 3 Blue Diamond Prelude. Eden Racing currently has a two year old daughter of Deep Field out of winning Henny Hughes mare Lawmaker. She too shows the assets required to successfully race as a two year-old. With Deep Field's success on both the race track and sales ring, our filly looms as prospect full of potential. View her profile by clicking here. Want to know more about Eden Racing's current two year-olds? Get in touch with Bloodstock Manager Harry Roach.